Aalborg Theatre is a place to discover everything from epic dramas to artistic experiments, where the audience can escape reality and witness performances full of nerve, presence and community. It is a meeting place for everyone – even those who would not usually step foot in a theatre. Located in Denmark’s fourth largest city, Aalborg Theatre has become a cultural institution and a popular meeting place. 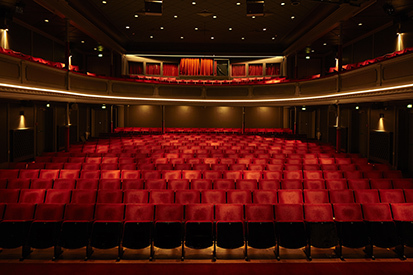 Established in 1878, the theatre is rich in history and tradition. Here, performances are reflections of society and of the time and culture in which we live. Aiming to both inspire and engage with the reality outside its walls, the theatre invites its audiences to reflect on literature, the visual arts, politics and many other topics throughout the year through talks, lectures and artistic performances. Another of Henriksen’s initiatives is involvement in a significant cultural project in Aalborg, with the working title AMPlify. Aalborg Theatre has teamed up with two other major players on the city’s culture scene, Kunsten Museum of Modern Art and the Musikkens Hus music venue, to create an event of international importance, where the three art forms collaborate to create exciting artistic and cultural experiences. “The project is planned for 2021 and is intended to be a recurring event, following the example of other cultural festivals in, for example, Bergen,” he says. Henriksen is also a firm believer in making sure that the audience can engage with performances and has therefore introduced three different concepts to the theatre café, designed to appeal to all ages. “With ‘Dialogue’, we discuss issues with celebrities, either in connection with performances or regarding other current affairs. Another, similar concept, ‘Format’, encourages conversations, music and artistic events for the younger generation. And finally, we have Larsens Teatersuppe, which is two hours of ‘hygge’ with music, stories, and exciting guests for pensioners,” says Henriksen. Aalborg Theatre is currently situated in its original building, but plans are in place to move to a new site in around 2020. “A brand new and spectacular district is in the making in an old industrial area on Aalborg’s waterfront. The theatre will hopefully move here and become part of this exciting urban renewal,” Henriksen reports with a smile. With larger, modern premises, the theatre will have more room to grow and can be adapted to future plans regarding flexibility and repertoire.